Bring the people who mean the most to you and spend time with them. As you look around, you will recognize that a lot of love, care and work went into this cabin. Dedicated to my parents, the Grandma/pa Cabin is full of charm and offers a cozy atmosphere that seems to embrace you in this special place. You will find the Grandma/pa cabin homey and inviting. Each room is unique, starting in the living room which features two unique Wildlife Buck Mounts, gas-log fireplace, a loveseat and sofa, and a lazy-boy recliner – typical of a hunting lounge atmosphere with the extra charm. There are three bedrooms total in the Grandma/pa cabin with two downstairs and one upstairs. Each bedroom has its own TV and plenty of windows. The cabin also has a loft with a sofa bed and foosball table. The back deck of this cabin is spacious and features a large uncovered hot tub with plenty of patio seating. Off the back deck there is a private fire pit for you to relax by while roasting marshmallows and telling ghost stories. Grandma/pa has a covered garage area as well as covered picnic tables closer to the playground area. The playground is in a large open courtyard nestled between the cabins of Last Resort Campground. Enjoy watching the children play as you relax in one of the rocking chairs on the front porch or swing in the porch swing. Across from the playground area is an additional fire pit area- large and open for large groups or reunions to enjoy their special time together. Bring your family and friends and experience nature where you can bike or hike right out your front door. BRING YOUR BICYCLES! The courtyard area of the Last Resort Campground features a large circle driveway with an incredible rock fire pit area. Enjoy the relaxing atmosphere of the Last Resort Cabins campgrounds. Eight cabins set amidst the lushness of the hardwood forest, this spacious getaway greets you with a casual invitation to come and enjoy. Grandma/pa Cabin is a two story cabin with three bedrooms and a loft. 2 Twin Futon mattresses located in the closets of the cabin (linen provided). The futon mattresses are perfect for kids or adults – the mattresses are 5 inches thick and can be placed in any room. The living room couch is not a sleeper sofa. Grandma/pa Cabin is a charming two story cabin with three bedrooms, two full bathrooms, a large outdoor deck area, hot tub, private fire pit, foosball table, and access to an outdoor playground. TV's are located in each bedroom and in the living room and all have cable access. The Grandma/pa Cabin is located in an area with other cabins, the area is known as Last Resort Campground, located on the Golf Course Road which is north of the lake. (Please click to view map) There are other cabins in this area. Each one offers limited privacy. The area in the back of the cabin is private and offers you plenty of space to hang-out. There are a lot of trees in this area. The land to the north of the campground is National Forest. Boats and Trailer parking is available for smaller vehicles. Space is limited. For larger vehicles, we can recommend areas close to the cabin. The road to the Grandma Cabin is black-top then it changes to gravel. There is only about 75 yards of a gravel road. It is motorcycle friendly. 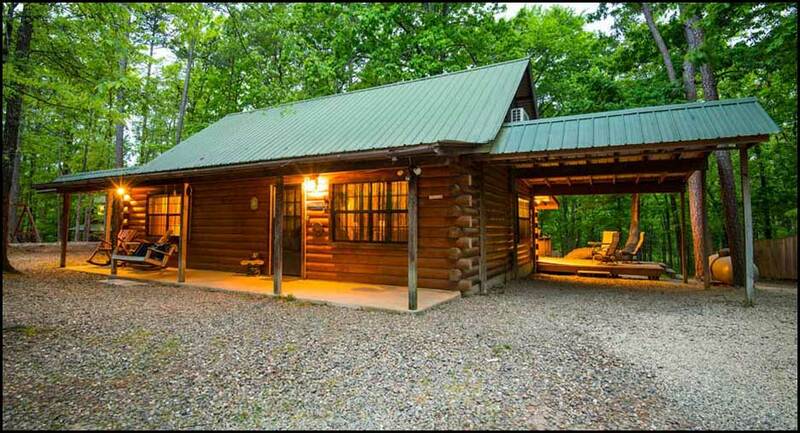 Located approximately one/fourth of a mile west off of Hwy 259 – you will hear limited highway noise from this cabin.